The 4C Spider is a high-octane ride that drivers will enjoy time and time again. An extraordinary bond between the driver and the road has been created with the Alfa Romeo 4C Spider. The 2019 model is designed for optimal performance with a sleek, aerodynamic design in a high-performance luxury sports car. The formula for innovation begins with the Alfa Romeo F1 engineers and cutting-edge technology found on the race track. These performances lead to innovations for the Alfa Romeo vehicle lineup, including the 4C Spider. Stronger and lighter than steel, the carbon fiber monocoque chassis has been designed to further enhance the power-to-weight ratio found in the 2019 4C Spider. The engine is mid-mounted in the chassis and is paired with a 6-speed twin-clutch transmission that drives the rear wheels. 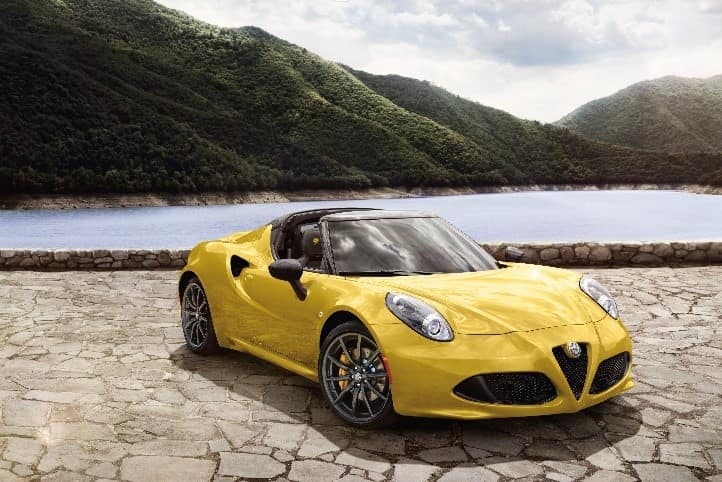 True to the Alfa Romeo racing heritage, the 4C Spider is equipped with an engine that is the embodiment of power. The 1750 turbocharged four-cylinder engine is pure power and fury can reach 0-60 mph is a mere 4.1 seconds₁. The turbo charger and pulse converter exhaust manifold are designed to boost torque and respond to every command from the driver. In continuation of the racing history inspiration, the Alfa Romeo 4C Spider features thicker sway bars to limit body roll even further during high-performance situations. The 2019 4C Spider is filled with performance-enhancing technology that is meant to take the driving experience to a higher level. Once in reverse, the rear backup camera conveniently displays a video of the area behind the 4C Spider on the rearview mirror. This capability helps determine if there are any obstacles blocking the path and allows the driver to focus on the mirror. Additionally, rear parking sensors help make parking maneuvers a breeze, especially in tight areas. The 4C Spider DNA Pro Drive Mode tailors the driving experience when the preferred driving mode is selected. Driving modes include All Weather Mode for severe weather conditions and slippery roads and Race Mode, which puts the driver in total control during race-like conditions. 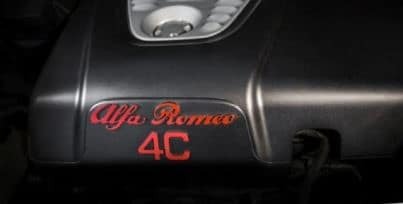 Drivers searching for a high-performance luxury driving experience can find the 2019 Alfa Romeo 4C Spider at our showroom on Central Ave in Albany, New York. ₁Based on manufacturer testing. Always drive carefully, consistent with conditions. Always wear your seatbelt and obey posted speed limits.